The ThINKin' Spot: Peachy Keen Sneak Peek! Good morning! You are just in "TIME" to check out my sneak peeks for the next stamp release at Peachy Keen Stamps. Our Peachy Keen Designers have been showing off some amazing creations with this month's soon-to-be-released Stamp of the Month and Peachy Picks Kit, and I do hope you've been dropping by the Peachy Keen Stamps Blog every morning to take in all the wonderful samples. Today I've got a couple of creations using the newest additions to the Peachy Keen line, and I sure hope you like what I've come up with as much as I liked making them. 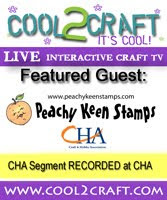 Both cards showcase the new stamps and items included in the Peachy Picks Kit. From great quality card stock to perfectly coordinated patterned paper and ribbons, this Peachy Picks Kit is nothing short of AWESOME! Everything on this card, except the clear button face on the adorable little clock was included in the Peachy Picks Kit. And again, everything from card stock to embellishments is a fabulous part of the Peachy Picks Kit coming your way. The only thing I added of my own here was the pompon for the hat, which I made from twine. Both images were stamped with Memento Tuxedo Black ink and colored with Copic markers. Thanks for dropping by today! Have a glorious day, and happy stamping!! These are so Pretty. Love your cards. The colors and shadings that you do are just PERFECT. Lorie, very creative and fun cards! Love them!!! Oh - LOVE these all! That clear button on the first one is so much fun!!! These are fabulous, love them!! These are so cute! I love the button on the clocks face! Please note that all content (text, photos and designs) of this site are copyright ©Lorie Souther. My original artwork is intended for personal use only to provide creative inspiration and may not be used for any publications, submissions or competitions. All other artwork shown on this site has been used with permission and credited to original artists. Stamps and other products shown or mentioned on this blog, may have been donated for promotional purposes by the company(ies) named in the post. Any endorsement by me is done so with enthusiasm for the quality product I believe it to be. All endorsements are my own personal opinion, and should be regarded as such. Hogs & Kisses and Happy Wishes!